SEATTLE – August 25, 2016 –Alaska Airlines Rock ‘n’ Roll Seattle Marathon & ½ Marathon, a signature Seafair Event today announced a new date for the 2017 event. The race, which is in its 9th year, will now take place on Sunday, June 18. Alaska Airlines Rock ‘n’ Roll Seattle has traditionally taken place on a Saturday. Registration for the event will open on Monday, August 29. 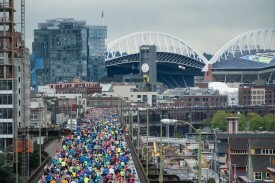 For more information or to sign up visit RunRocknRoll.com/Seattle. In true Rock ‘n’ Roll fashion, live bands, enthusiastic cheerleaders and spectators will line the race route, concluding with a celebratory finish line festival and Toyota Rock ‘n’ Roll Concert Series. Race weekend kicks off with a free Health & Fitness Expo, where runners can find the latest in running technologies, fitness apparel, health and nutrition information and interactive displays. The Expo takes place at CenturyLink Field Event Center on Friday, June 16 from 12:00 p.m. to 7:00 p.m. and Saturday, June 17 from 9:00 a.m. to 5:00 p.m. The Expo is free and open to the public.